Ambitious doesn't even begin to describe "Cloud Atlas," which marks the first collaboration between Andy and Lana Wachowski and Tom Tykwer. Powerhouse screen visionaries, the trio find an unusual harmony for their mighty endeavor, providing a smooth melt of specialized sensibilities as they tackle an adaptation of an "unfilmable" novel by author David Mitchell. Overlong yet undeniably powerful and inventively arranged, "Cloud Atlas" demands viewers permit the creative team a chance to make their case. They take their time but come armed with exquisite production achievements and a byzantine story that actually manages to find a satisfying conclusion, despite a complex, borderline unintelligible first half that all but promises an oncoming narrative disaster. In 1850, Adam (Jim Sturgess) is a notary who comes across the enslavement of a South Seas tribe, befriending warrior Autua (David Gyasi). While returning home to his family, Adam is struck ill, requiring the services of Dr. Henry (Tom Hanks) to ease his suspicious pain. In 1931, Robert (Ben Whishaw) is a musician in love with Rufus (James D'Arcy), taking a job as an assistant to Vyvyan (Jim Broadbent), a cantankerous composer. When Rufus's genius is threatened by Vyvyan, the young, unstable man takes drastic action to preserve his musical achievements and clear his mind of thought as he puts the finishing touches on his magnum opus. In 1975, Luisa (Halle Berry) is a reporter investigating an oil company run by Hooks (Hugh Grant, contributing impressively for a change), stumbling across evidence of corruption that puts her life in danger, requiring help from shadow figure Joe (Keith David) to help evade assassin Smoke (a game Hugo Weaving). In 2012, publisher Cavendish (Broadbent) finds himself in trouble with debts after Hoggins (Hanks), his star client, goes to prison. Hitting up brother Denholme (Grant) for help, Cavendish is instead locked inside of a nursing home, soon planning to make a great escape. In the future, Sonmi-351 (Doona Bae) is a service clone at a fast food restaurant finding her consciousness opened when resistance fighter Chang (Sturgess) is tasked with rescuing the woman, careening toward an ultimate purpose she doesn't yet understand. And in the wilds of a post-apocalyptic planet, tribesman Zachry is greeted by Meronym (Berry), a member of an advanced civilization on the hunt for answers located atop a perilous mountain, requiring the service of the primitive, who's currently waging war with a savage enemy (Grant). "Cloud Atlas" is an enormous picture portioned out into tiny poetic bites of tragedy and heroism. Working to preserve Mitchell's expanse, the filmmakers take their time with the material, eating up nearly three hours to wind their way through these linked lives, finding the participants bound together with a special comet birthmark used as a visual stamp to ease the audience into a boomerang story. It's challenging work, requiring careful attention to plotlines that have been woven together meticulously, bouncing around the eras in a seemingly haphazard manner for the initial 90 minutes, spending time soaking up details and personalities before the various tales begin to take shape. "Cloud Atlas" does test patience on occasion, with the run time on the excessive side, displaying an unnecessary indulgence with certain story points. Another editorial pass wouldn't have hurt the movie in the least, but the trade-off is a thoroughly lived-in effort that builds entire worlds and manages significant characterizations that help to guide outsiders through what becomes a big screen maze of spinning years and vaguely familiar faces. It's difficult to tell exactly how the work was divvied up, but those who've paid close attention to "The Matrix" trilogy should be able to decipher Tykwer's touch and the Wachowskis' impact. United in aspiration, "Cloud Atlas" is seamlessly assembled, an impressive balancing act considering the depth of emotion required for a few of the subplots, while action and intrigue heats up the rest. Staying true to their gifts, the movie is stunning to behold, with extravagant costumes and disturbing environments to examine, while the showy make-up work alone is worth the price of admission. With a core set of actors portraying all types of races and genders, "Cloud Atlas" shows startling freedom with the ensemble, allowing them to embody the oddest characters, yet they commit in full to the fantasy. For those who've spent a lifetime waiting to see Keith David made over as an Asian warrior, this is your Christmas morning. The technical achievements are exceptional, always keeping the picture gripping when the material periodically decides to chase its own tail. With the Blu-ray release, fans of the movie will have a chance to re-watch the film from the convenience of their own homes while newcomers will be able to experience this stunning vision for the first time at their own leisure. When it comes to visual and auditory experiences, you can't get much better than this movie. Offering a 1080p in High Definition, Cloud Atlas explodes off the screen, presenting the most scenic backgrounds in cinema to date. Every crease, wrinkle, and pair of crows feet comes with such definition, you could practically run your finger along them. The same can be said of the audio, especially during the future sequences where over saturation of technology adds to the listening experience instead of detracting from it. Equally impressive are the bonus features, which include many in depth interviews from the cast and crew on topics such as dividing up the director's tasks, a deep look at the connections that tie the story together, attempting to unravel the themes, mysteries, and subext of the story and finally exploring the future world of Cloud Atlas where cloning and planetary exploration are every day occurrences. This is an enormous film, teeming with violence and shock, stroking a braided narrative that's always on the go. It's a brave directorial endeavor from Tykwer and the Wachowskis. That they could piece together a coherent picture is a testament to their skill, while the sheer scale of the effort celebrates their endearingly daredevil appetites. Definitely worth the rental. 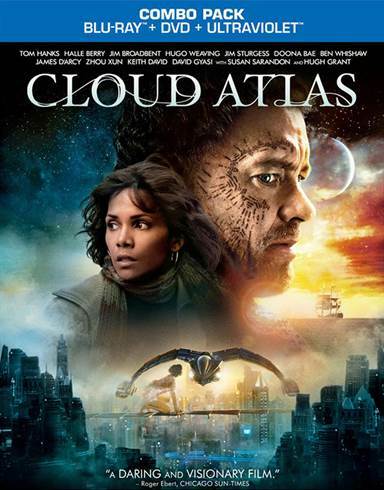 Download Cloud Atlas from the iTunes Store in Digial HD. For more information about Cloud Atlas visit the FlickDirect Movie Database.